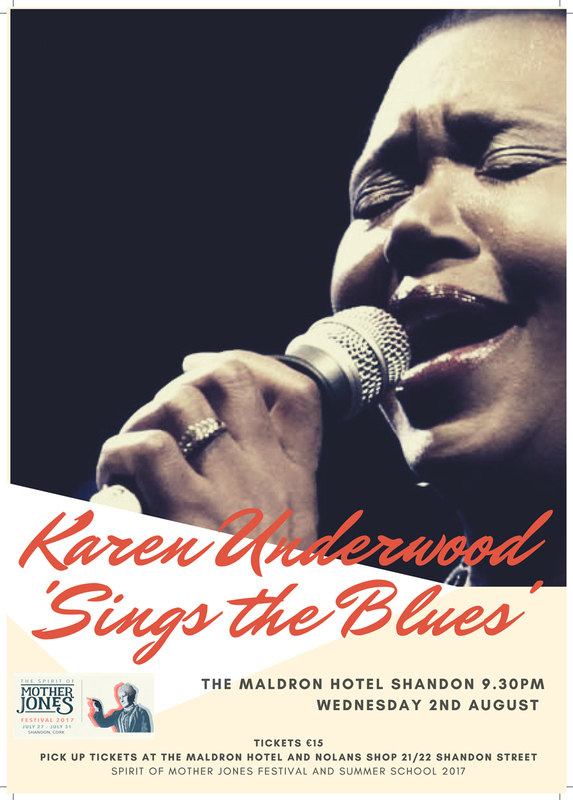 Tickets are still available for the Karen Underwood concert which takes place at the Maldron Hotel this Wednesday night at the Spirit of Mother Jones Festival, starting at 9.30 pm. Karen was born in Chicago in the early 60s at a time when the Civil Rights movement was gaining momentum. Her home was full of music and song and she absorbed many musical influences as a young girl from Nat King Cole to Church and Gospel music. She arrived in Cork in her 30s around 1997 and settled in the city. Here she experimented with various musical genres however the music of her heroine Nina Simone was celebrated in her show “The Nina in Me” where she sings many of Nina Simone’s songs interspersed with commentary of life, her memories of America and the tragedy, joys and experiences of her life in Cork. Karen’s version of “Mississippi Goddamn” is awesome while “Strange Fruit”, with its echoes of lynching in America resonate the growing fear in today’s Trump’s America. Her live performances are a tribute to her extraordinary versatility and her embracement of what life throws at one. Karen has performed all over Ireland, including the National Concert Hall, the Olympia, the Gaiety and she has appeared on numerous TV and radio programmes.